"The Short-lived Oracle 早终的先知 (zao zhong de xian zhi)"
It is said that Cao Cao 曹操 would have won the war if Guo Jia had lived longer. In the early days of Cao Cao's expeditions, there were usually more than one advisor by Cao Cao's side, but Guo Jia's analysis of situations and predictions always seemed to be correct. It is a pity that Guo Jia and Zhuge Liang 诸葛亮 belonged to two different chronological segments, and thus never had a chance to compete head-to-head. Despite knowing his days were numbered, Guo Jia could accurately predict how the near future would unravel. On realizing that Guo Jia was absolutely right about how things played out even weeks after his death, Cao Cao wept for the loss of this amazing talent. Like Dian Wei 典韦, Guo Jia died much too early and severely handicapped the potential of Cao Cao's army. The game makers of San Guo Sha 三国杀 paid adequate tribute to the brilliance of Guo Jia by making him one of the most powerful and most popular characters in the entire game. A search of player comments on forums turn up numerous praises for Guo Jia, with many declaring him their all-time favorite character to use. Character ability 1: "Envy of Heaven 天妒 (tiān dù)"
After your judgement card takes effect, you can acquire the judgement card. 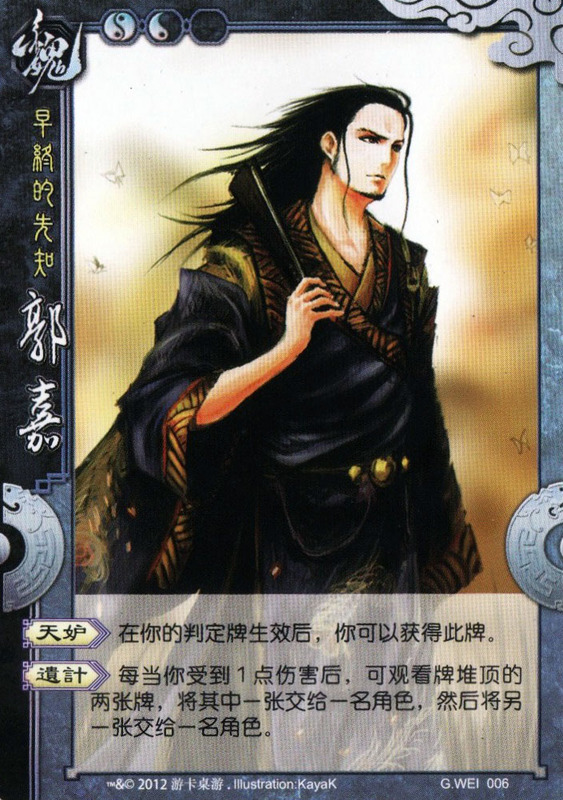 Character ability 2: " Bequeathed Strategy 遗计 (yí jì)"
After every 1 unit of damage you suffer, you can view the top two cards of the deck, give one card to a player, then give the remaining card to a player. The term “immediately” is removed to clarify the timing of activating “Envy of Heaven”. The ability description of “Bequeathed Strategy” has been changed from “drawing then giving” to “viewing then giving”. Brilliant!!! The chinese name for "Envy of Heaven" is called 天妒 and is short for a more common phrase called 天妒英才 (tiān dù yīng cíi). It translates as "heaven is jealous of a person with such immense intellect/skill/potential" and is morbidly used to describe rare talents who died young. Chinese like to think that heaven struck them down out of jealousy. Guo Jia's "Envy of Heaven" ability seems to mock the heavens as he can benefit from heaven's will (judgement cards). "Bequeathed Strategy" is equally apt as it almost re-enacts Guo Jia's contribution to Cao Cao after dying. Read more about the story behind "Bequeathed Strategy" below.